Update: NYT public ed. has now hit the paper for failing to publish the cover--after also not running past covers last week. In Paris, copies already sold out at many vendors despite million copy (or three million, some say) print run. One of best takes on the new "Charlie Hebdo" cover from the ever-reliable BagNewsNotes (along with a shot at the NYT and others not publishing). 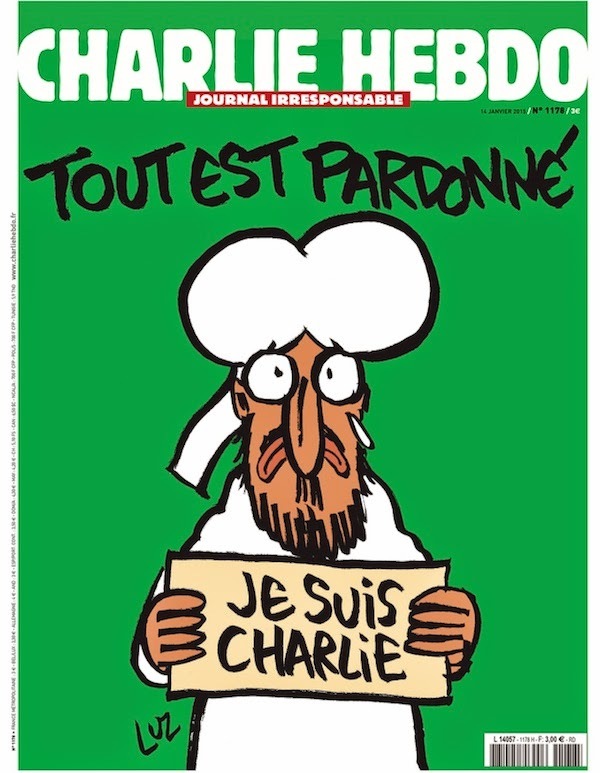 Excerpt: "So, to the extent the opposite meaning needs a literal foil, what Charlie Hebdo provides us — in an atmosphere crying out for understanding — is a manifest image in which Muhammad is not blasphemed at all, but makes himself visible against that peaceable green because the actions in his name are not representative of him and forgiveness (beyond just intolerance of satire) is in order."